The caking rare earth magnet hydraulic press guarantees the powder materials will take the wanted shape with a smooth and even surface and density as well. It also has the asynchronous bidirectional suppression (fluctuation to suppress) and the synchronization bidirectional, two ways of suppressing forms. Separately shaping for asymmetrical components and symmetrical components reduces agglutination or distortion enhancing a qualified surface. The caking rare earth magnetic hydraulic press can control the position protection and suppressed ways, ensuring the product volume and uniformity. The caking rare earth magnet press hydraulic system uses cartridge valve blocks, water cooling system, and reliable hose connection, which guarantees the stable and reliable movement and few leakage points. Meanwhile, its oil pump helps reduce energy consumption. The caking rare earth magnet hydraulic press has an imported PLC control system and time relay control system. It offers different material pressing methods to suit customers' varied demands. 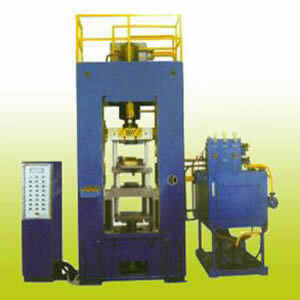 This hydraulic press series is suitable for shaping and reshaping magnetic materials, ceramics or hard alloy. Optional configurations of the caking rare earth magnet hydraulic press include touch screen display monitor, displacement pressure transmitter, automatic feeding equipment, and more.